Made from high quality textured Leather Materials. Comfortable, perfect for the office. Nicely designed. See the perfect Pointed classic design. Beautiful and nicely done. Upper leather is in excellent condition, Insoles are clean. Anne Klein Women’s Leather - Open Toe Sandal Mule Heel 2.5" Slides Slip On size 6 1/2M leather upper with manmade sole. “Mabrittany” preowned in great shape. Condition is Pre-owned. More heels listed with similar size and style. Excellent preowned condition. Very slight signs of wear. Anne Klein Womens Size 6 M Black Leather Pointy Toe Kitten heel pumps. Adjustable sling back straps, buckle detail on toes. Genuine leather. Preowned in very good condition, leather looks like new. Inside has some slight wear, but no major imperfections. Heels are 2.5 inches high. Open toe with cross over style, textured SHINY leather, solid wedge heel. Can be worn for formal dress. New ANNE KLEIN 'GIGI' Black Leather Pointy Toe Buckle Strap Slingback Pencil 2.5" Heel. They are leather uppers with leather soles. The heels are 2 1/2". The sandals are in good conditions, the inner lining is starting peel but it doesn't affect the functionality or the look on the outside of the sandals. Toe shape: Round. Material: Leather. Sole: Man-made. Shoes ANNE KLEIN 3" Kitten Heel DUSTY ROSE PINK Strappy Sandals Leather 8 M. Condition is Pre-owned. 'Island' Leather Strappy Kitten Heels. ANNE KLEIN. 'Dusty Rose' ~ Pale Pink. These shoes are pre-owned, in good condition. They are women's size 6M. They are made of brown leather uppers and the heels are 3 inches tall. There is some wear around the toe areas, and the soles of the shoes. Tracking number included. The heels are black, and the heel height is 3 3/8”. Whereas the uppers are leather, the soles are man-made. The heels are in very good condition. 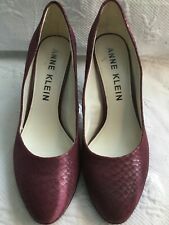 Anne Klein. Sandals Heels. Green Leather. Very good preowned condition. A bit of wear on heels. Scratches on one toe, but still in great condition. More heels listed with similar size and style. Nice for office or casual wear. Anne Klein navy blue leather pumps - Size 11 - Classic with silver medallion! These versatile shoes are US size 11 and can be easily dressed up or down. I take excellent care of my belongings and unless otherwise noted, they are pre-owned and sold as is.